This is a lovely hardback book to hold and touch, with irregularly cut pages and splendid b&w prints at the beginning of each chapter. A disappearing luxury and rare physical pleasure in this advancing age of ebooks. Peter Gay, whose original name—as Jan-Maat told me-- was Fröhlich, is also a joy to read. In my academic growth I learnt to revere him and now, years later, I have felt it was time to pick up another of his books and see whether I felt a similar deference. 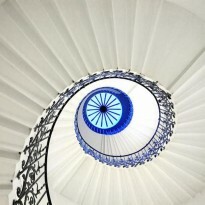 Gay/Fröhlich as a cultural historian is known for his studies of the Enlightenment, of the Weimar Republic, and of Freud and the Victorian Age under a Freudian eye. I have to admit that I have never been very interested in Freud (I probably share this with many other women) although I may not have approached him properly and I am probably being unfair. Related to this prejudice of mine (and please, do not try to psychoanalyze it) I also tend to get extremely bored by psychoanalytic approaches to novels, or by attempts to diagnose characters and/or authors. Gay’s Freudianism in this literary study is not formulaic nor reductionist. It remains very subtle, and therefore convincing. 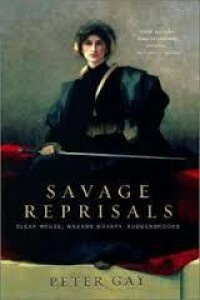 Savage Reprisals (what a great title!) consists of three essays on three novels, together with a brilliant prologue and an excellent epilogue. The novels he has selected are Bleak House, Madame Bovary and Buddenbrooks. I have recently read the first and the third, and the second some years back. In the prologue he identifies three possible values to be extracted out of reading a novel: One as approaching it as a source of civilized pleasures; the second as a didactic instrument for self improvement; and third and final, as a document that opens doors to its culture. He has chosen to focus on the latter, and this leads him to raise several issues related to the writing of history and to the writing of fiction. The forceful realist tradition he adroitly locates in all its international extension, that is, across France, Britain, France, US, Russia, Spain, Germany and Portugal, even if some countries were more precocious than others. In this extended and major Realist current, and he includes also the subgenre of historical fiction, he evaluates the capacity that literary Realism has to portray or represent the authenticity of a given society and the interest it thus raises for historians and fiction writers and or readers. But it is really the concern of a modernist, Virginia Woolf, who stated that “the foundation of good fiction is character-creating and nothing else”, that serves Gay to introduce his three analyses as samples of fiction that go “Beyond the Reality Principle”. En each of the three studies, he examines how in these novels, while still embedded and securely placed in a carefully constructed social and political setting, the authors have chosen to dig deeper into their characters with a more engaged psychological analysis. He sees that these three books explore other aspects not normally found in pure realist fiction. One reviewer in this site has complained that there was no connection between the three essays. I disagree. Without going into detail in Gay’s analyses I will just provide what I think links them in his consideration. In the essay The Angry Anarchist, Gay underlines how in Bleak House Dickens created, in what is still the most “realist” of the three samples, a rather artificial construction, in spite of its apparent mirroring of reality. In this composition, he wielded the portrayal of circumstances to adjust it to an overwrought setting, as well as fashioned his characters either as superhuman or as caricatures, thereby creating a sort of counterpoint that would bring forth his denouncement of a society that he found vicious and worryingly at fault. The following essay, The Phobic Anatomist, presents a Madame Bovary in which Flaubert, in spite of the obsessive research with which he prepared his novels and all the meticulous minutiae, felt completely free to depart from pre-established frameworks. He flexed his literary powers to create his own rules and pursue his own version of truth. The result is an overstated Emma as a compressed and condensed psyche of discontent. In the last essay, or The Mutinous Patrician, Gay plots how in his Buddenbrooks, Thomas Mann waved between a realist depiction of the patriciate and an incisive and self-conscious psychological exploration of a few individuals. If Mann liked to vaunt that his Buddenbrooks had anticipated Max Weber and other scholarly sociological studies of a modern Buergertum, he also wrote to his brother Heinrich that “the whole thing is metaphysics, music and adolescent eroticism” in his new novel. As we could expect, some psychoanalytic considerations are included in all three essays. With Dickens we read about the uneasiness he felt with women and this is explained by his resentment towards his mother and his impossible fascination with his sister in law. With Flaubert we are reminded of his correspondence with his muse Louise Colet and his parallel and periodic visits to whorehouses. And particularly with Mann, his sort of buried homosexuality, and the self-incriminating diaries he allowed to be published an established number of years after his death, are all very attractive aspects for a cultural scholar who has specialized on Freud. If in his Prologue we saw that Gay introduced his studies on Beyond-Realism through the quote of a modernist, we then see him opening his Epilogue with another quote from another Modernist. Proust is presented as an exponent of the shifting interest on the source of reality in fiction. With him it is the inner being of an individual where his truthful world lies and which also makes history.